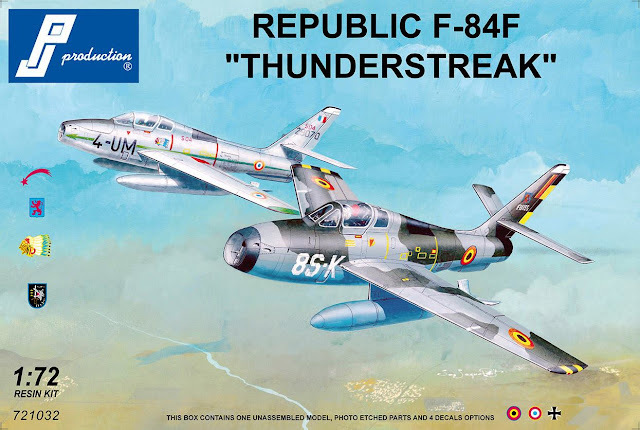 1_72_aircraft_news 1/72 1/72 kits F-84 reissue Republic Thunderstreak . :PJ Production:. Republic F-84F "Thunderstreak"
Last but not least, a reissue of the f-84 f thunderstreak is planned for early 2019. It will always be a fully resin kit but with new decorations. We hope to satisfy the Belgian F-84 enthusiasts since two decorations are planned (NATO and Vietnam Camouflage). There will also be a French Decoration, a German and a Dutch is under study.